The SEC charged a marijuana consulting company and its executives with conducting illegal stock sales. The SEC filed its court Complaint in California against Medbox, Inc., a marijuana consulting services company that also claimed to sell biometric identification vending machines capable of dispensing marijuana. The SEC alleged that Medbox’s founder, Vincent Mehdizadeh created a shell company (“New-Age”) to conduct millions of dollars worth of illegal stock sales pertaining to Medbox. The Medbox shares sold through New-Age were restricted securities that were not eligible for public sale. According to the Complaint, Mehdizadeh funneled the capital raised in those illegal stock sales back into Medbox in exchange for (1) an assignment of Medbox accounts receivables that New-Age never collected; (2) additional restricted shares; (3) dispensary “management rights” that Medbox did not own; and (4) other rights that Medbox did not possess. The Complaint stated that this illegal scheme enabled Medbox to claim higher revenue and earnings performance than the company actually achieved from 2012-2014. Medbox subsequently cited those fictitious revenues in press releases to promote record revenues and establish itself as a highly successful, rapidly growing business. According to the SEC, the majority of Medbox’s revenue during this period was actually derived from the illegal stock sales conducted through the New-Age shell company. Mehdizadeh also purportedly transferred capital from New-Age into a real estate escrow account that he then used to acquire a luxury home in Pacific Palisades, CA. 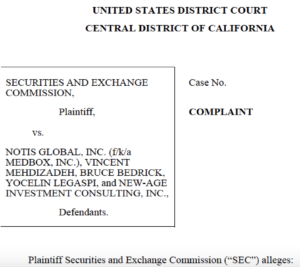 The SEC also charged Medbox CEO Bruce Bedrick with being complicit in Mehdizadeh’s scheme. Per the court Complaint, Bedrick was aware that New-Age was owned by Mehdizadeh, and he approved specific transactions while being aware that they provided no tangential value to New-Age. Bedrick allegedly sold over 710,000 of his Medbox shares in private placements or public sales, garnering $6,483,180 in total sales proceeds. Mehdizadehʼ s then-fiancée Yocelin Legaspi, who was supposedly acting as New-Age’s CEO, was also charged with participating in the fraud through the unlawful selling of unregistered securities. Specifically, the Complaint alleged that Medbox made materially false filings with the SEC. Supposedly, Medbox maintained false books and records that did not truthfully reflect its accounts receivable, revenue, and related-party transactions. These things constituted books and records frauds. By failing to implement adequate controls to ensure the proper recognition of those things, Medbox committed internal controls violations. Furthermore, according to the Complaint, Mehdizadeh knowingly or recklessly lied when he signed false management representation letters that were provided to Medbox’s auditors. Mehdizadeh and Medbox agreed to settle the SECʼs charges. According to the SEC’s press release, Mehdizadeh agreed to pay over $12 million in disgorgement and penalties. He also agreed to be barred from serving as an officer or director of a public company, and to be barred from participating in any penny stock offerings.